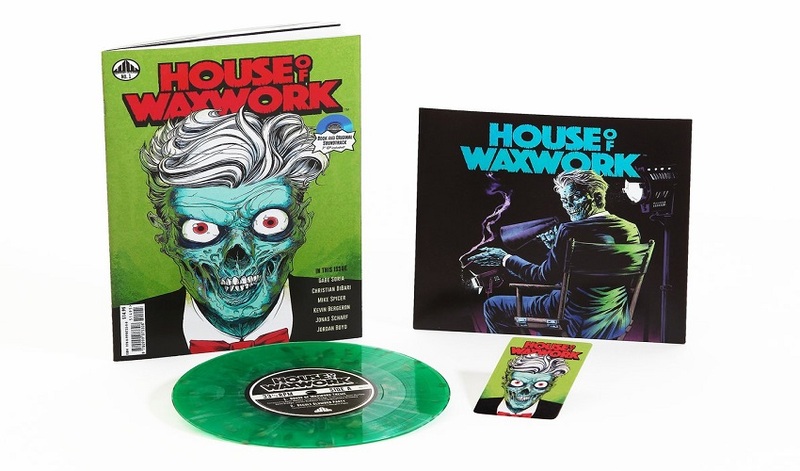 Waxwork Records have quickly made a name for themselves with a barrage of stylish vinyl releases and reissues of scores and soundtracks to not only cult and mainstream horror films, but also from some of the more popular video games of our youth. In particular, their recent release of the Castlevania 2: Simon’s Quest soundtrack was a gorgeous collectible not only featuring beautiful cover art, but was also released in a variety of slick colored vinyl choices that coincided with the game’s themes, such as a dual colored “Day/Night” version. 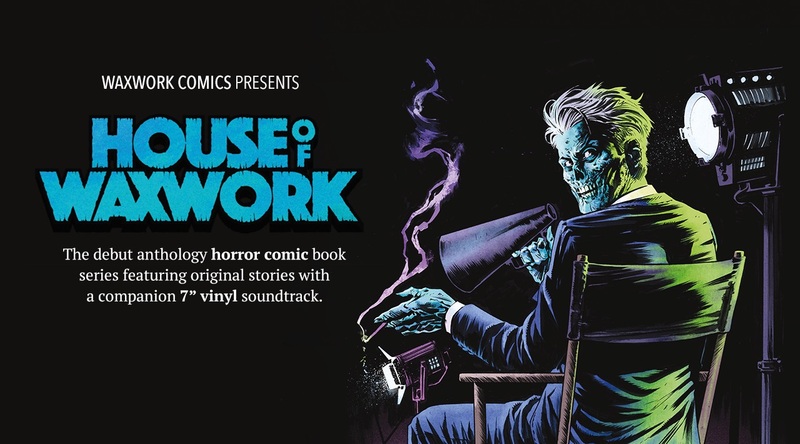 So, it was a nice surprise (although, not a BIG one) to learn that they were planning on branching out into the realm of horror comics with the release of their new House of Waxwork series. While the inclusion of an accompanying record was far from a new idea, the concept of original tracks created and composed for each issue’s stories and pressed onto one of those highly popular colored vinyls made this not only a potentially hot collectible, but also seemed like a clever way to help immerse the reader in the “world(s)” created within each of these stories. Set up like an episode of Tales From the Crypt or even an issue of DC Comics’ House of Secrets or House of Mystery books, the issue begins with an introduction from series’ “host”, The Die-rector. Think along the lines of an undead Robert Evans. Ok, just think of Robert Evans. There might be some complaint that the Die-rector’s cheesy horror-tinged puns and wordplay are too close to that of the Crypt Keeper as to constitute a “rip-off”, but that’s probably an unfair assessment as horror hosts, real and fictional, have been using that sort of humor since the beginning. Despite this being the introductory issue, Waxwork doesn’t let the Die-rector take up too much time with introductions as the 1st story starts on the next page. Enforcing the theme of each story being its own “mini-movie”, each segment is introduced with its own gorgeous mock poster art. This is where I immediately fell in love with this comic. As any fan of pre-1990’s horror can (and usually will) tell you (whether you want them to or not), the often-elaborate artistic images featured on horror film posters or VHS covers were usually all it took to sell a theater ticket or get a tape rented. While the “nostalgia” will undoubtedly win over many, the overall quality of artist Marc Schoenbach’s work will undoubtedly have those fans clamoring for more. The first story is entitled “Occult Slumber Party”. In this tale, a family stops at a small roadside antiques dealer while traveling to a weekend getaway at a cabin secluded deep in the woods. In the store, they find an old board game called “Occult Slumber Party” (oh, THAT’s how they got the title). They purchase the game and leave the store, plans made to play the game together once they reach the cabin. 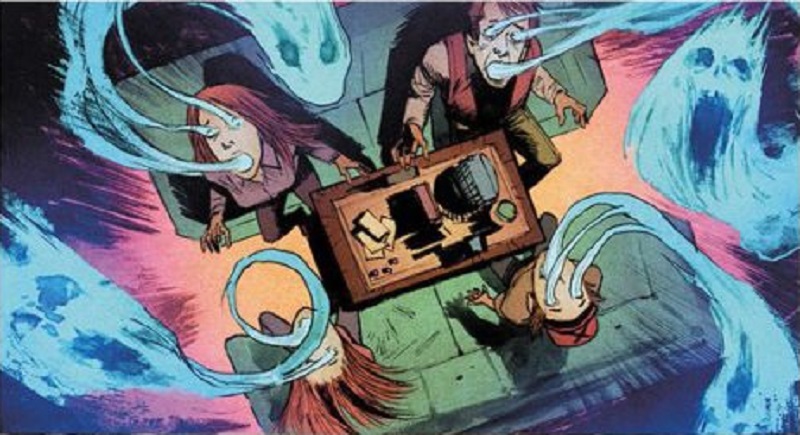 As with the comic itself, the game comes with a record that the players listen to in order to help “set the appropriate spooky mood”. The daughter turns over the game’s hourglass and makes the first dice roll. She rolls 3 6’s. 6-6-6. This serves the same as a magic spell, sucking the family into the game itself. The family is then forced to play the game FOR REAL, which means finding their way out of the house within 1 hour or having their souls stuck within the game forever. However, just like any good game, the house is not without its share of traps and monsters ready to rip the family members to shreds. The story starts strong with a trip, albeit brief, from room to room as the family members try to find a way out. The monsters soon arrive, and while most are quickly dealt with, a few casualties do occur. Unfortunately, the story begins to feel more than a little rushed once the 1st death occurs. That said, it’s still a fairly entertaining story, if not overly deep. 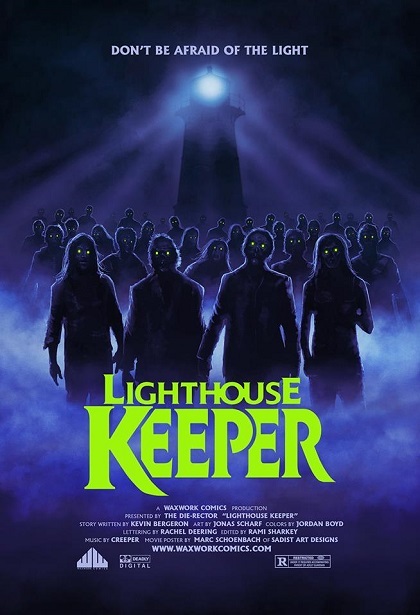 The next story, entitled “Lighthouse Keeper”, features a poster image that is more than a little reminiscent of the cover art found on MGM’s DVD release of John Carpenter’s The Fog. That said, the similarities stop there. Well, sort of. A recently paroled inmate in need of a new start accepts a 3-month gig maintaining and operating a lighthouse stationed on a small island offshore. Before accepting the job, he is warned about the “tricks” that 3 months isolation can play on the human psyche. Having been imprisoned, the man is more than used to solitary confinement and is seemingly not phased by the task ahead of him. The man is also informed of not only the 100 men that died trying to build the lighthouse over 130 years prior, but also of the unfortunate fate that befell the last caretaker. Days roll by with no issue and the new lighthouse keeper easily falls into the daily routine with little to no sign of adverse effect caused by the isolation. That is, until near the end of his 3-month “shift”. During an exceptionally violent storm, the caretaker begins to hear voices. He is soon assaulted by the undead corpses of numerous women, all of whom are intent on making him pay for their deaths. However, is the caretaker even the one responsible or is this just an unfortunate case of being in the wrong place at the wrong time? Without giving too much away, a series of twists and turns reveal that not all is as it seems. While the story ends on what I felt to be an uneven, mildly confusing note, the dire, spooky tone of the story runs from beginning to end. The images of the ghouls, as well as the lighthouse’s position away from any means of help or rescue, undeniably sell the feeling of being trapped, while the reveal of the lighthouse’s history make the “evil” within feel much more ancient than it actually is. The book ends with the conclusion of “Lighthouse Keeper”. While by no means a “make or break” deal, I do feel that an “epilogue” from the Die-rector would have been a nice, effective way to tie everything together, as well as possibly acting as a set-up for the next issue’s set of grisly tales. Side 1 starts off with the “House of Waxwork Theme”, as composed by Rami Sharkey and Kevin Dredge, and performed with the Budapest Scoring Symphonic Orchestra. As this is the “theme” to the series, I would imagine that it will lead off each new issues’ accompanying vinyl. The theme makes a fitting intro to the series, and has much the same “feel” as the theme from Tales From The Crypt, albeit with much less of that iconic Danny Elfman style. I’d imagine that many will start to skip this track if included on future releases, so maybe occasionally having remixed versions featured might be a nice change of pace. 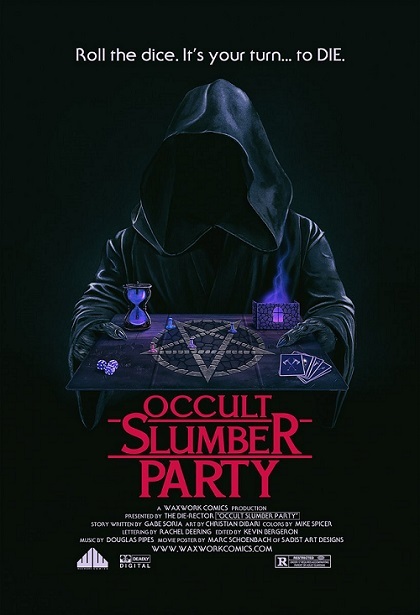 Side 1 also features the theme song for the comic’s first story, “Occult Slumber Party”, as composed and performed by Douglas Pipes, best known for his work on Michael Doughtery’s Trick R’ Treat and Krampus (as well as the obscure late-80’s slasher, Moonstalker). The track begins with some appropriate sounding, marginally distorted synthesizer bars. The song drastically slows in tempo as some heavy bass synths kick in, before finally adding in a back beat. The track feels reminiscent of the scores found in John Carpenter’s early films, with more than a touch of the Halloween themes (and even Unsolved Mysteries?) running through the track. The vinyl’s 2nd side features the theme to “Lighthouse Keeper”, as composed and performed by Creeper. The track starts with some softer, yet droning pads. This quickly leads to another synth heavy track with a still somewhat of a Carpenter vibe. The track again features a few de-tuned notes. While the track does evoke a sense of dread and impending doom, it honestly doesn’t have a very strong “horror” vibe to it, making it a little less fitting to the story than it probably could and should have been. Overall, House of Waxwork is an impressive debut, albeit one with a few minor flaws. While the stories contained within could have been marginally improved, the book itself more than compensates by being so damned stylish. Featuring an impressive soundtrack on yet another of those cool colored vinyls that Waxwork has become synonymous with, this series is one that I hope to see continue and grow.